In a previous article we’ve covered a tutorial for implementing Google Analytics tracking for your catalogs. Once you’ve followed the steps presented in that tutorial, you will be able to see some data in Analytics, and we explained where to look for it. But there is a better way to view your catalog statistics in Analytics and we’ll show you how in this article. Instead of applying various filters to various charts, graphs and tables, you can simply import our dashboard and view a plethora of reports regarding your catalogs in one single dashboard. What is the Flipsnack Analytics dashboard? 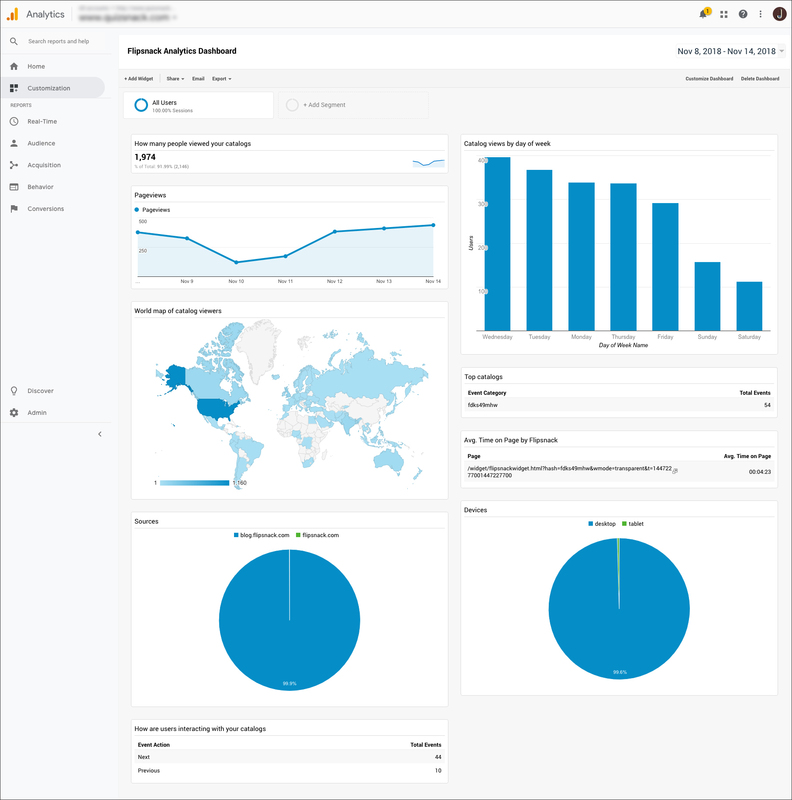 The Flipsnack Analytics dashboard is a custom bundle of reports configured by us. It contains a set of 9 charts and tables which were build to only display information regarding Flipsnack catalogs. Once imported into your account, it will become populated with data from your connected Flipsnack catalogs. So even though we’ve pre-configured the dashboard, each one of you will see different chart data, because that data comes from your catalogs, not ours and not someone else’s. Read more about custom GA dashboards. The dashboard contains an overview report summary of all flipbooks connected to GA. So keep this in mind: the data is the sum of all catalogs connected to Google Analytics. If you’d like to see more granular data, for each catalog, you will need to add a few more charts, or simply access Statistics in your Flipsnack account. How do I import this view in my Analytics? 1. Log into your Google Analytics account, select the property which was used for connecting catalog statistics and the view where you want to see this dashboard. 3. 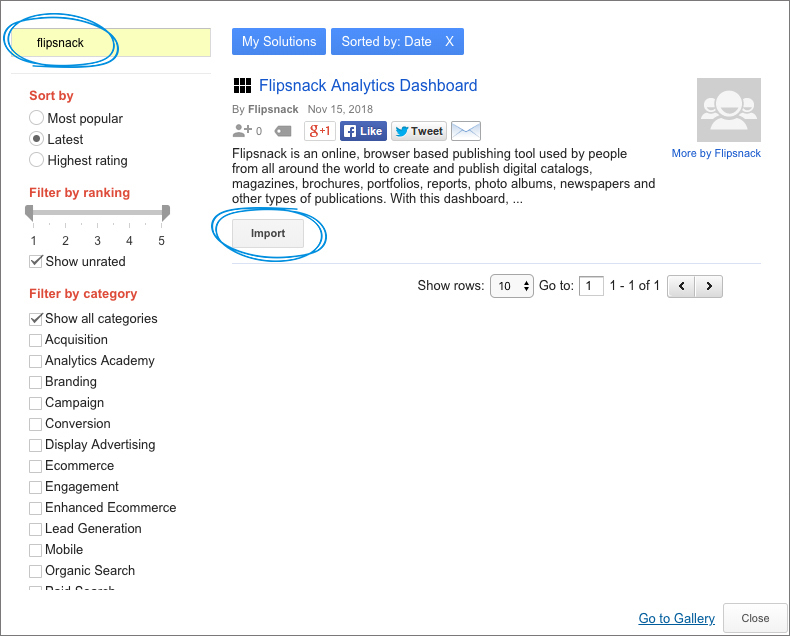 Write a name (Flipsnack Analytics Dashboard, for example) and click Import form gallery. 4. Search for Flipsnack in the Solutions gallery. Alternatively, you can start by clicking Import in the Flipsnack’s analytics dashboard from the solutions Gallery, and select the right property and view in the popin window (as instructed above in step 1). After you import our dashboard in your Analytics account, you can go look for it in your account, in Customization - Dashboards. Just click Flipsnack Analytics Dashboard and you will see all the reports there. The more advanced Analytics users probably have some customization ideas already. These Analytics dashboards are fairly easy to customize. You can add more charts and graphs by clicking Add widget. From there on, it’s entirely up to you what type of widget and what type of data you choose to display in your new chart. If you want to display data from just one specific catalog in your chart, make sure you apply a filter to only show - event category - exactly matching and then insert the unique hash ID of the catalog. (You can easily find it in your Flipsnack account: My flipbooks - Settings - Analytics, exactly under the field were you added your Google Analytics tracking ID. It’s a combination of 9 lowercase letters and figures). Before you save your chart, rename the chart, so you’ll know later what you’re looking at. I would write the name of the catalog. You can also customize the layout of your dashboard as you like. Google Analytics gives you 6 layout options, so choose the one that you like best. You can delete this dashboard at anytime. As long as your catalogs are connected with Google Analytics tracking, you will still have your data in Analytics and deleting the dashboard will not have any impact on that. That’s about it for now! If you’re encountering any problems while importing or after importing the dashboard, read our troubleshooting guide for the Analytics dashboard.